Do you like Football Accumulators? So, this bookie will be an excellent choice! Ladbrokes undoubtedly is one of the most famous brands in the world of bookmakers and one of the oldest, because the company appeared on the market in 1886. One of the biggest operators in the UK gaming market owns a network of 3,000 betting shops and since 2000 has been providing its services online. In 2015 the company reaches an agreement with its rival Gala Coral Group and two famous bookmakers form Ladbrokes Coral Group plc, but each continues to run a business under its own brand. The new company banded together two great operators and the reputation of these bookmakers became only stronger. Ladbrokes Coral Group plc is listed on the London Stock Exchange and licensed by the British Gambling Commission (for UK customers) and by the Gibraltar Gambling Commissioner (for international customers). Ladbrokes can be called a traditional British bookmaker, however, this betting site gone beyond the classic British, as this bookie offers Asian handicaps, which is pretty rare for UK sites, another good news for all fans of betting that you will find ‘Ladbrokes exchange’ section, which characterizes this company as an innovator in the gambling market. The special characteristics of this bookmaker are the uninterrupted promotions, which are always a lot, for example, at the time of writing this article there was 15 promotions on their website. Ladbrokes website is without a doubt one of the most handy to use, perhaps, when you visiting this betting platform for the first time, you do not agree with this! However, after making a few bets and a little getting used, you will understand that this is one of the fastest betting sites on the net and search of the bet will take a minimum of time. Ladbrokes offers website in 17 different languages, as usual, you can to customise the site according to your individual interests by setting the time zone, language, odds format (fractional, decimal and American) and so on. Many things happen on the main page, and, on the one hand, the website seems to be overloaded, but on the other hand, you can get instant access to any section and it is very convenient, so the main drawback can be called the main advantage of this betting site. The first horizontal menu gives you the opportunity to get access to the main sections of the site: Sports, Casino, Slots, Games, Live Casino, Bingo, Poker, Virtual Games, Mobile Applications, Exchange and the Grid. In the upper right corner, you can choose the language and other settings, as well as choose the start page – ‘football’ or, for example, ‘horse races’. In the main menu, you will get access to A-Z Sports, In-Play & Streaming, Football, Football Coupons, Horse Racing, Greyhounds, Tennis, Golf, Cricket and Promotions. On the main page, you will see in-play sports events, the most popular upcoming events of the day, and there is a list of promotions and other current and useful information in the right column. To find the event that you need is very simple. Click on ‘A-Z Sports’ and choose, say, football. You will be offered 5 most popular leagues, but if you are interested in another tournament, then choose “More” and find the country, and then the league you are interested in. Everything happens fast enough, but honestly, to choose a large number of selections for the accumulator, you need too many clicks… Ladbrokes betting will be easier for you thanks to a large number of useful features like betting news, live results, audio comments, web cast and much more. It is hardly possible to call this platform the perfect betting product or the fastest and most convenient site on the net, but you will not have trouble while interacting with it. Along with the big-name European bookmakers, Ladbrokes sports betting can be the best choice for you. Perhaps this bookmaker is inferior in choice of markets to such grand as Bet365, but still among the leaders. This bookie offers all sports, and of course, being British by nature, this site proposes a huge selection of football leagues for 40 countries, you will be able to find even obscure leagues here, and sometimes the number of minor divisions for one country can reach five or six! The depth of the markets is simply amazing, for example, the number of betting markets can reach 180 for one popular football game! And that’s not all, because for such top leagues as English Premier League, Ladbrokes offers unique combined bets at increased odds, which called #GetAPrice, for example, ‘Team To Win + Both Teams To Score + Over Corners’ or ‘Team To Win + Over Bookings Points’. Betting menu on the site is very convenient when you choose a match, as all bet types are divided into blocks ‘Main Markets’, ‘Goal Markets’, ‘Goalscorer Markets’, ‘Half Markets’, ‘Score Markets’, ‘Team Goals Markets’, ‘Other Markets’ and ‘#GetPrice’, so you can always get instant access to any market and do not spend a lot of time for searching. Ladbrokes, along with BetFair and Matchbook, offers a betting exchange service, however, while it is only in its infancy and much inferior to its competitors, however, it is likely that in the near future this company will make significant progress in this direction. On the Exchange, the player pays only 2.5% of the winnings, which is certainly much more effective than betting at the bookmaker’s lines, where the average margin is about 4.9%. In general, the odds quality can be describe as the average on the market, while Ladbrokes odds cannot be called among the best on football, because the bookmaker runs a betting margin of 6%, which is unexpected for a British company that is usually focused on this sport. Nevertheless, the betting margin is an average value and that does not mean that you will not find the best odds here – if you like to bet on the main markets and you are fan of the top European leagues, then you can expect to find a good prices. As for other sports, the margin varies from 4% to 5%, so the bookmaker is not the best, but not the worst. 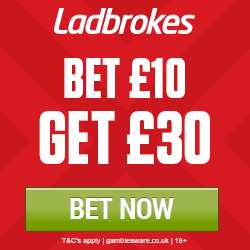 Ladbrokes horse racing is always offered at the best odds guaranteed. Betting limits are very high here and as usually depend on the markets and the leagues. If we talk about top European football leagues and horse and greyhound races, then the maximum winnings is €1,000,000 per day. Less popular European leagues, for example, Scandinavian, have maximum winnings up to €500,000 per day and you can win a maximum of €250,000 with bets on minor divisions. For the biggest tennis tournaments and NFL, MLB, NBA, NHL a limit of €500,000 is set. All other tournaments, leagues and unpopular sports have different limits, from €50,000 to €100,000 per day. 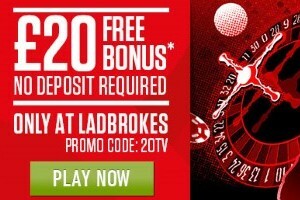 Ladbrokes Casino section is one of the best in the market, here you will find everything you want and even more! Ladbrokes Live betting is one of the bookmaker’s strengths! Perhaps, this site is inferior to several competitors by the number of video broadcasts, but you still can expect that you can bet on the top leagues while watching live streaming. Therewith, the bookmaker guarantees live streaming of all main horse and greyhounds racings. Info graphic on the site is probably the most beautiful among all the betting sites, you can learn from it all the useful for betting statistics that will help you make the right choice. Betting coverage is excellent, if we are talking about games from the top European football leagues, then you can count on a hundred or more betting markets, if it will be minor divisions, then you will see about 50-60 markets. Unfortunately, the live odds quality is middling, and only sometimes prices are higher than average. In-play live platform works quickly and without any glitches, the odds change fast and the stakes calculate instantly – this live betting product can be safely called decent and are able to meet competition. 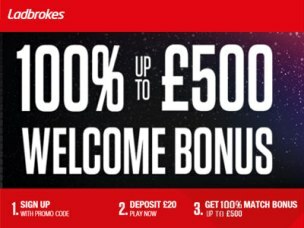 Ladbrokes free bets, bonuses and other promotions have always been the hallmark of this bookmaker and if you open an account here, be sure – you will get a lot of pleasant surprises! £50 FREE BET. Just open an account, using promo code F50, deposit a minimum of £/€5, and then place a bet on any amount at odds of 1.50 or greater and get a free matched bet up to £/€50. 5 TEAM ACCA INSURANCE. Place a 5 or more-fold accumulator on football games at minimum odds of 1.10 and if one of your selection let you down, the bookmaker will refund your loosing acca up to £/€25 as a free bet. BET £5 GET £20. Just open account, entering promo code B5G20 on the registration page, and deposit a minimum of £/€5. Remember that your first bet on the site must be £/€5 or more. After your first bet, the bookmaker gives you £/€20 in four free bets! THE RACING WEEKENDER. Simply bet minimum £20 in one or more stakes from Monday to Thursday and get your £5 Free Bet on your account! VIRTUAL SPORTS WELCOME OFFER. This promo only applies to Mobile Ladbrokes customers, all you need is place your first ever bet on Virtuals at odds of 2.0 or greater and you will get a matched Free Bet up to £10. Ladbrokes has one of the biggest lists of payment methods and you definitely find banking options that you want. You can deposit and withdrawal (minimum is £5) via cards Visa, Visa Eletron, Visa Debit, Mastercard, Maestro, Solo (UK), Laser. Withdrawal time is up to 5 days, deposit is instant. As usual, the most fast and handy way is e-wallets Neteller, PayPal, Moneybookers, ClickandBuy, Ukash, EntroPay. Minimum deposit or withdrawal is £10. Bank Transfer, Western Union Quick Pay and Cheque withdrawals usually take 1-5 banking days. Ladbrokes Support service is available in all of the known methods. First of all, we advise you to read FAQ. If you have simple questions, you better use Live chat on the website, which is available in English, Spanish, German and Swedish. A phone call could be right choice, because this way is most multilingual (0800 731 6191 for UK and +44 208 515 2565 for the rest of the world). Also you can send Email to care@ladbrokesgames.com.